HCM CITY (VNS) — Coffee produced in the Central Highlands province of Dak Lak found its way into 80 countries and territories this year, 20 more markets than the number reported early this year. Export turnover stands at US$440 million so far this year, a year-on-year increase of 23 per cent and nearly 59 per cent of the annual goal. The top 10 importers of Dak Lak coffee were Germany, Japan, the US, Italy, Switzerland, the Republic of Korea (RoK), India, Spain, Indonesia and Russia. The September 2 Import-Export Company, Dak Lak's leading coffee exporter, brought in $147 million from shipping 73,657 tonnes overseas, 114.23 per cent higher than earnings from the same period last year. Dak Lak boasts over 200,000 ha of coffee plantations that produce up to 400,000 tonnes of beans annually, accounting for 30 per cent of the nation's coffee land. 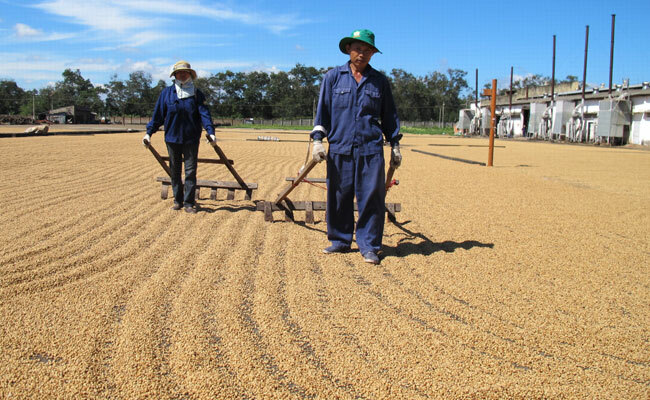 In order to satisfy the quality requirements and increasing demand of foreign markets, local authorities have worked out measures to improve the quality and output of exported coffee. Farmers are being encouraged to clean up production in order to meet the increasingly strict demands of importers. An estimated 41,000 farms in Dak Lak are now following standardised coffee-growing models, such as the 4C Code of Conduct, Rainforest Alliance, Fair Trade and UTZ Certified. The province plans to continue expanding coffee-growing areas licensed to use the PGI and will seek support from the European Trade Policy and Investment Support Project (EU-MUTRAP) to help Buon Ma Thuot coffee enter the European market.